Since rompers are such a hit this summer, it only seems natural that overalls have hit the fashion radar for the fall. My freshman year of college, I started out as a pre-med major. (Go ahead. Laugh now. It's funny. I know). To weed out the slackers, pre-med biology was at the ungodly hour of 7 a.m. every Monday, Wednesday, and Friday. I am one of those people who likes to sleep in until the very last possible minute, and this killer first semester of college was a prime example of that. I had two pairs of overalls, and I would wear one of the two pairs EVERY SINGLE CLASS. I would sleep in a t-shirt, roll of out bed, throw on the overalls with flip flops and drudge to class. One day, toward the end of the semester, I actually woke up early and decided to wear regular jeans. I think I may have even brushed my hair. I kid you not: in complete seriousness, the dude I had sat next to the entire semester looked at me that morning and asked me if I was new to class that day! Nonetheless, after seeing these new looks, I'm willing to give overalls another try. Maybe this time without the ill fitting t-shirt underneath and shower shoes. Inspired by Bug's recent trip to Goodwill, I think I'll jaunt on over to Savers today to see if I can find a nice pair of overalls from the 70's. No reason to shell out $325 on the Betsy Johnson pair (on the left), if I can find a pair for under $10... right? EDIT [5 Aug 2009, 8:45 p.m.]: This is hilarious! 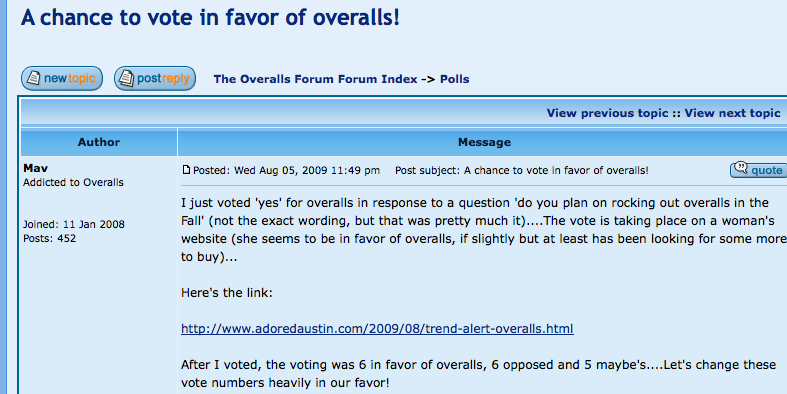 I had to remove the poll from this post because some dudes at a Girls in Overalls forum (yes, an entire forum) found this and thought it would be in their best interest to skew the poll results heavily in favor of more girls in overalls. Can I just say that I had no idea that there is a men's forum out there that is solely dedicated to women in overalls... and that the forum is active? She could be a farmer in those clothes!